Two polls conducted in 2007 found the public generally thought the media's coverage of the war in Iraq skewed in a negative, pessimistic direction. 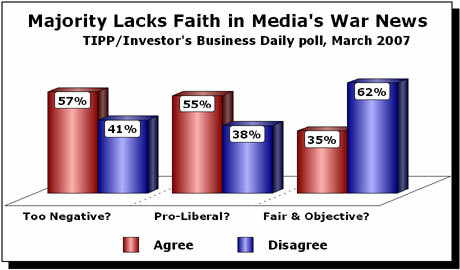 A March 5-11 TIPP poll of 900 adults done for Investor's Business Daily found the public judged the media's war coverage as 'neither fair nor objective.' A Pew Research Center analysis published August 9 found a big drop from 2003 to 2007 in the percentage of Americans who said they were 'confident' that they were getting an accurate picture of how the war was going, with Republicans much more trusting of statements from official military sources, and Democrats preferring the media's message. When TIPP/IBD asked whether 'generally speaking, [has] coverage of the war been fair and objective,' only 35 percent agreed, compared to 62 percent who disagreed. The TIPP/IBD poll also found that most Americans thought media coverage of the war in Iraq was too negative (57 percent) and too liberal in viewpoint (55 percent). The Pew Research Center analysis found that while 81 percent of the overall public voiced confidence in the accuracy of media reports when the war began in March 2003, that had dropped to just 42 percent in July 2007. However, a majority of Americans (52%) expressed confidence in the accuracy of military reports about the war. Pew discovered a sharp partisan divide, with more than three-fourths of Republicans (76 percent) at least somewhat confident in the military's portrayal of how the war is going, compared with just 36 percent of Democrats. 'By contrast, a solid majority of Democrats (56%) have confidence in the press to give an accurate picture of Iraq,' compared to just 35 percent of Republicans who said they were confident of the accuracy of war coverage.